Officials of the Chinese Communist Party (CCP) have launched a fresh attempt to censor the Internet under the pretext of “fighting corruption.” Internet users are encouraged to submit information to a new tip-off website; those who do may be arrested. However, Chinese people are fighting back as they continue to use the Internet to expose corrupt officials and speak their mind. The tip-off website was started by the CCP’s Central Commission for Discipline Inspection (CCDI) in order to receive complaints from the public as “an important source of clues in the fight against corruption,” according to CCP mouthpiece Xinhua. The website opened on Sept. 2 and received 377,450 reports that day, according to the Sept. issue of Hong Kong-based The Trend Magazine. The large number of access requests overloaded the website, and it stopped working five times that day, with the longest breakdown lasting 31 minutes. In the subsequent two days, the website received 257,420 reports and 313,821 reports respectively. For instance, police arrested Duan Xiaowen of Central China’s Hunan province for “suspected troublemaking,” according to a Southern Metropolis Daily report. Duan is well-known for posting questions about why a local beauty pageant queen quickly become a city government official and for exposing who owned a house that was apparently built illegally on top of a 5-story building, the Daily reported. Beijing Police confirmed on Sept. 28 the arrest of renowned environmental activist Dong Liangjie for “making trouble,” Xinhua reported. Dong has over 300,000 followers on Weibo and has exposed issues such as contraceptives in tap water and high lead content in pork in Nanjing City. The regime claims that Dong made these issues up to boost his reputation. 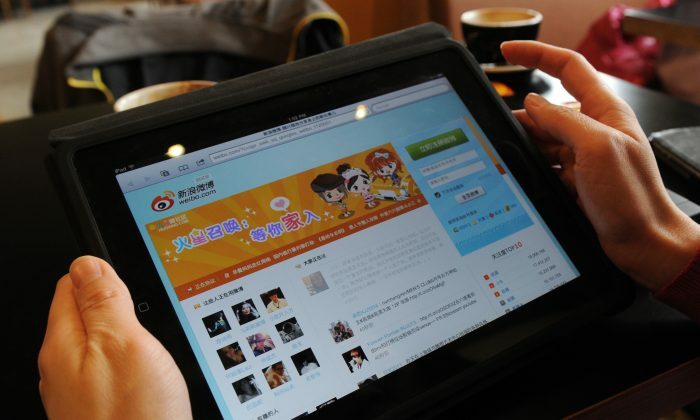 Current affair commentator Chen Simin said he believes the regime’s crackdown won’t be effective, and even with such a massive propaganda machine, the regime cannot beat Weibo. Chen said that Weibo is spreading the uncensored truth people long for. He believes Chinese Internet users are actually the ones who control the spread of information on the Internet. Pei Minxin, Professor of Government at Claremont McKenna College, commented on the CCP’s current situation in an article on New Straits Times. “In the last decade, a series of scandals and crises—involving public safety, adulterated food and drugs, and environmental pollution—has thoroughly destroyed what little credibility lingered [for the CCP],” Pei wrote. “But several emerging trends, unobserved or noted only in isolation, have greatly altered the balance of power between the CCP and Chinese society, with the former losing credibility and control and the latter gaining strength and confidence,” Pei added. Translation by Olivia Li. Written in English by Sally Appert. Lee Kai-fu, a prominent venture capitalist with liberal political views, has been attacked as part of a recent campaign being waged by Chinese communist authorities.